Two Wharton sophomores have found a way to share contacts at various settings, from parties to recruiting events. Vite! is a mobile networking application created by Wharton sophomores Cole Pergament and Seth Sholk that gives students a way to share all forms of formal and informal contact information quickly. By signing in with Facebook or Twitter, Vite! allows users to create a profile linking contact forms such as email, phone number and social media accounts. Users can select which accounts they want to share and produce a personalized QR code that instantly sends account information between phones. “We’re trying to change behavior,” Pergament said. “We are making a better way for people to connect on their mobile devices, through less formal modes of communication." The concept for Vite! was devised by Pergament in the summer of 2016. After attending several networking events, Pergament realized there were no networking applications for the iPhone or Android that allowed users to "share some accounts with one person and different accounts with another." In the fall of 2016, Pergament and Sholk started to work on a pitch for the app and won the Penn Startup Pitch Competition held by TAMID at Penn, a group under Penn Hillel that gives students hands-on opportunities to learn about entrepreneurship and business through exposure to the Israeli economy. After winning the competition, the team behind Vite! grew the pitch into an application. Steven Grutman, Sholk’s friend from high school who now attends the University of Maryland, joined as the chief technology officer to work on coding and development. Vite!’s biggest challenge at the moment is marketing and growth, the students said. "We're trying to focus on two things, GBMs and group meetings, where people are meeting new people and trying to get in touch," Sholk said. 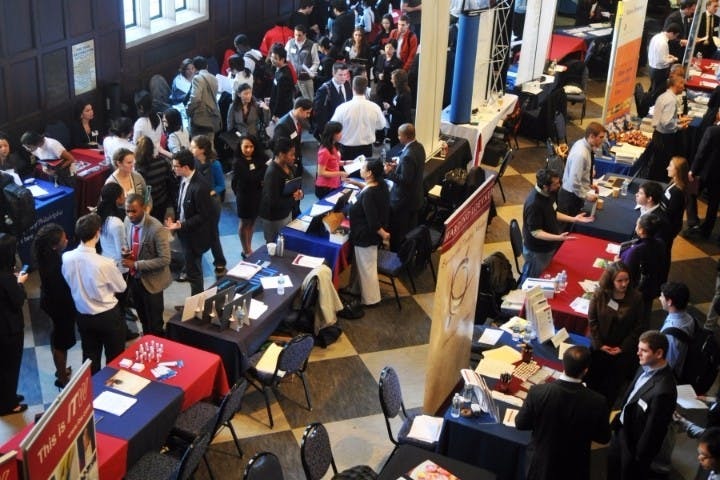 "We're also trying to get into different kinds of conferences or job fairs." Pergament agreed, adding that the team is focusing on "bringing people together" rather than blasting marketing strategies. Vite! will face competition from already established networking apps such as Inigo and Sprouter, but the Vite! team believes in their product.